The history of space exploration is rich with photos from NASA that detail the history of space travel, breakthrough propulsion systems, groundbreaking astronauts and missions, and robotic exploration. Each weekday, SPACE.com looks back at the history of spaceflight, from the early days of the space race through the space shuttle era, from the years of the first rockets and satellites to the test-flight era that preceded human spaceflight, and of course beyond. 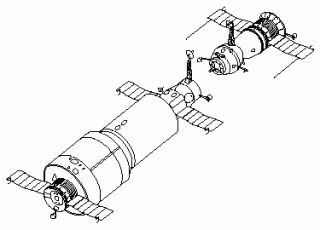 The Soviet Union launched the Cosmos 482 Venus probe on March 31, 1972. But the failed Venus craft is crashing back to Earth soon. NASA's Apollo 12 mission sent three astronauts to the moon in November 1969 to make the second crewed lunar landing in history. See how that mission went in photos in our photo gallery here! The Freedom was intended to be a permanently inhabited orbiting base. Astronaut Kathy Sullivan poses for a picture with her space suit. A Mercury spacecraft lands in the ocean after launched from Little Joe in a High-Q-Abort test. After a successful mission, Cooper is assisted from his mercury capsule. The first all-female crew of scientific experimenters prepare experiments that were used during the Space Shuttle/Spacelab missions. A helicopter attempt to empty sea water from the Liberty Bell 7 fails. The Apollo 9 Lunar Module is seen from the command module during the Apollo 9 earth-orbital mission. During the Friendship 7 mission, John Glenn experiences weightlessness. The former NASA Assistant Administrator for Policy and former Assistant Director for Research Applications at the National Science Foundation came to NACA in 1944. Langley technicians manufacture the Boilerplate Mercury spacecraft. Astronaut Edward H. White II, pilot for the Gemini-Titan 4 space flight, floats in space during America’s first spacewalk. John Glenn runs through training exercises. This astronaut has a big smile after his orbit mission in Faith 7. NASA engineers reassembled the MA-1 Capsule to determine what caused the explosion. Two astronauts humorously demonstrate zero-gravity during the Skylab 4 mission.